Musical Theatre News: Casting for Tour of Oliver! 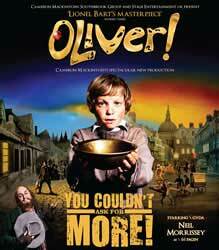 Casting for Tour of Oliver! As already announced Brian Conley and Neil Morrissey (Men Behaving Badly) are sharing the role of Fagin in the tour of Oliver which begins in Cardiff on 12th December. They will be joined by Samantha Barks who was one of the finalists in the Andrew Lloyd Webber "I'd Do Anything" search for Nancy and who has recently been playing Eponine in Les Miserables as Nancy (to 23rd June 2012). Iain Fletcher is Bill Sikes, Jack Edwards/Mr Bumble, Suzie Chard/Widow Corney, Stephen Moore/Mr Brownlow, David Langham/Mr Sowerberry, C J Johnson/Mrs Sowerberry, Stevie Hutchinson/Noah Claypole, Emma Dukes as Bet and Victoria Hay as Charlotte. The members of the ensemble are: Lincoln Hudson, James Gant, Hadrian Delacey, Joe Maxwell, Kade Ferraiolo, Lee Dillon-Stuart, Matt Harrop, Ryan O'Gorman, Annie Wensak, Kara Lane, Claire Parrish, Alison Connell, Sophie Caton, Beth Davies, Mikaela Newton, Paul Farrell, Nicholas Duncan, Sarah Cortez and Mary Fox. Thanks for pointing that out. As far as I am aware the only names missing are the children playing the roles of Oliver and Dodger. These have now been added to my web page.